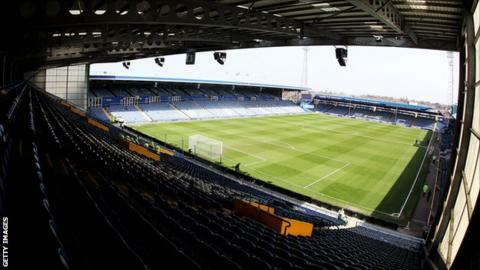 Portsmouth supporters group SOS Pompey say the financially stricken club are approaching closure and have called on the remaining players at Fratton Park to be "part of history" and save them. The club have eight senior players left on their books and their salaries are preventing a takeover of Portsmouth. Unless they leave Fratton Park or take a pay cut the club could be liquidated. "This is the end game for Pompey, in a couple of weeks it will be over," SOS spokesman Bob Beech told BBC Solent. In June, Portpin agreed to complete its purchase of the club on condition the wage bill was reduced through player sales and compromise agreements. But administrator Trevor Birch has so far been unable to achieve sufficient savings by this strategy alone. On Friday staff at the club were told they face being made redundant and in an interview on Sunday Birch said Portsmouth were "two to three weeks away from closure". SOS Pompey presented the club's senior players with a written plea at the entrance of the club's training ground on Monday in an attempt to make them compromise on their salaries. Several of those players stopped to listen to them, but others including Tal Ben Haim - who is said to be on £36,000 a week refused to acknowledge them. "Some players were excellent and stopped to listen to what we said, others as expected weren't interested and drove straight on," added Beech. "At the end of the day, they have contracts and they expect those contracts to be paid and that is not an unreasonable stance for them to take. "But the well is dry and if they stay and keep their demands going then there will be no club and they will end up with nothing." Beech is bitter at Pompey's ongoing crisis but still believes the players could save the club. "Trevor Birch has to save the club and people could lose their livelihoods as a result," he said. "That is scandalous because the people who put us in this mess are still clinging to the wreckage and claiming millions of pounds off the club. "But the players could still be part of history and save this club."